We are going to play along with the backing track and build the song up. Follow the instructions with the lyrics below! Do check out the 'Handy hints' below the lyrics for playing this piece! Click here to JUMP! My grand-ma and your grand-ma were sit-tin' by the fire. My grand-ma told your grand-ma: "I'm gon-na set your flag on fire." Talk-in' 'bout, Hey now ! Hey now ! Hey now ! Hey now ! My flag boy and your flag boy were sit-tin' by the fire. My flag boy told your flag boy: "I'm gon-na set your flag on fire." 'Handy Hints' for playing this piece! use the 'crabby claws' technique. Play the second string ('E') with the first finger on the RH and the 3rd string (Open 'C') with your thumb. Keep the LH first finger down all the time. 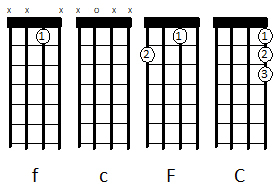 When you start playing the chords in full try muting them (put your RH flat on the strings) after each strum and that may help keep your playing in time. Its a straight strum on the beat! You're home and dry! Remember to play the chorus twice to finish.